I have read articles by other bloggers and they pointed out something that I haven't thought of. While where you live may seem mundane and normal to you, people from somewhere else may want to visit it. There may be attractions around you that people are willing to travel great distances to experience. Who better to write about these places than someone that lives nearby, knows their way around, and understands the area and local customs? We have to remember.....to someone in Berlin, the American south may be an exotic and different place they want to visit and experience. I have met people in Nashville who traveled from Japan, just to go to one particular music club. Everyone unknowingly and unintentionally becomes bored by familiarity. We all live in a place that someone not familiar with our country, region, or customs will find fascinating. This seems incredibly logical to me........so here is my first attempt at writing about my own area of the world instead of an exotic locale somewhere else. Welcome to the United States south. Questions are always welcome! We all live in a place that is intriguing to someone. Sometimes we need that someone to remind us. Laurie had a doctor appointment Friday afternoon in Murfreesboro, Tennessee. I took Friday afternoon off to take her and we planned a short adventure afterwards to a semi local (within two hours) tourist attraction that we truly enjoy visiting. Laurie's doctor is a blog reader and fellow traveler and we always trade travel stories during appointments. A shout out to Dr. Busbee......things are going great! The entire Barrett line is available here! After Laurie's appointment, we stopped at an attraction just south of Murfreesboro in Christiana, called Outpost Armory. 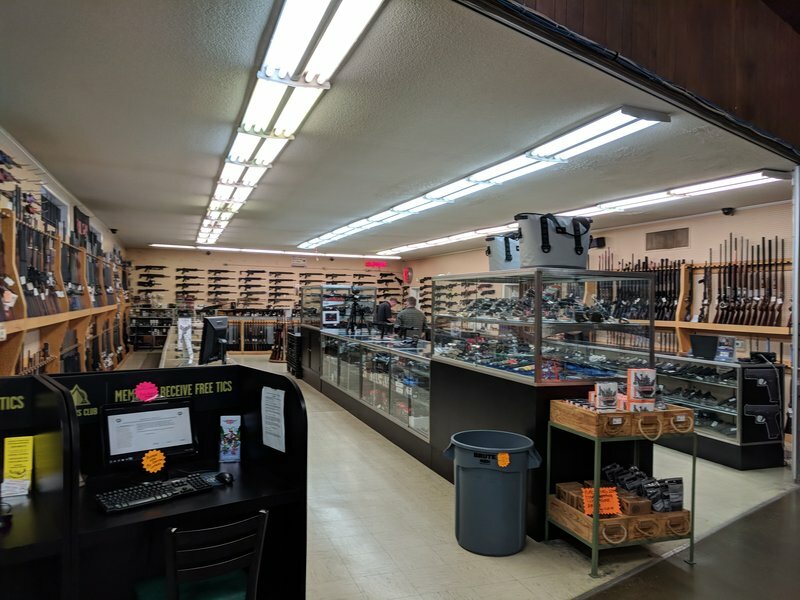 It is a massive gun shop with targets, clothing, range goods, ammunition, scopes, jewelry, targets, reloading supplies, and just about anything the serious competition shooter needs. 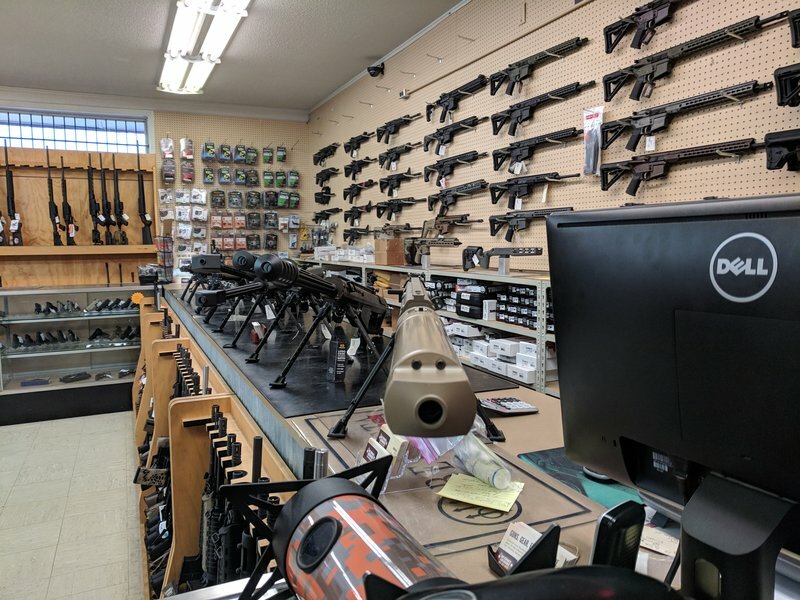 Outpost Armory is owned by a local Murfreesboro company that you may have heard of, called Barrett Firearms. If you're interested in that, yes......they have the full line, and yes, you can check them out....and even buy one if you've got that kind of money! Be aware that a top of the line Barrett in .50 BMG will run you $10k.....without a scope. We wander through and check out the wares on display. The staff is very cordial and knowledgeable. We don't hang out too long but I do a little Christmas shopping for some smaller fun stuff, then we head on down I-24 South. Boat parking....with an outlet to charge the trolling motor batteries! We head out looking for dinner, and wind up eating at a chain steak house. It was okay.....but few people go to Scottsboro for the dining. The parking lot had many trucks and boats and the patrons were mostly locals and visiting fishermen and hunters. I couldn't really locate the kind of quirky, locals type dinner restaurants we so enjoy. I'm sure there are one or two there, but we didn't know where they were. Maybe next time. A very nice coffeehouse in a historic building, right on the courthouse square. 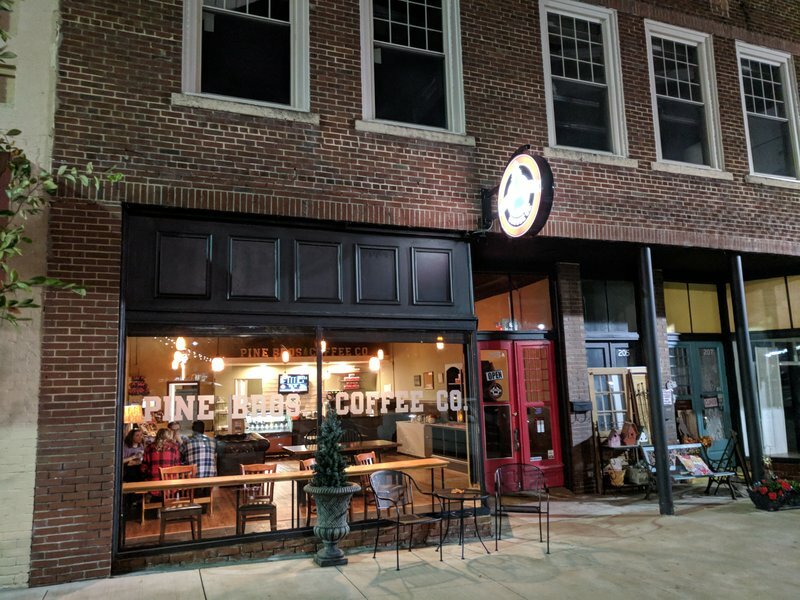 We found Pine Brothers Coffee the same way most people unfamiliar with the area would, via a web search. 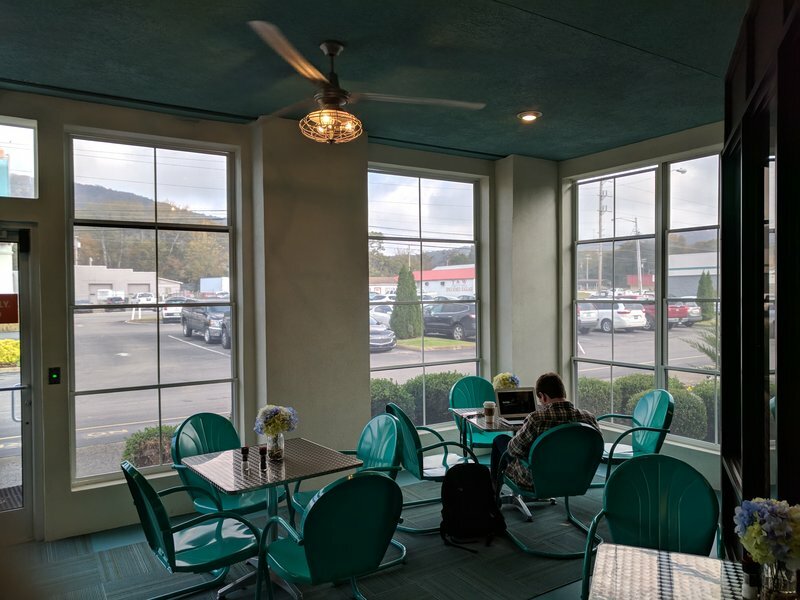 We found a historic building that had been renovated to house a very nice coffee house. We sat and enjoyed our coffee while a few locals came and went and local kids sat and chatted. It was a very pleasant surprise in a small southern town. After this we went for a stroll around the courthouse square then headed out. It's a very quiet Friday night on the courthouse square! 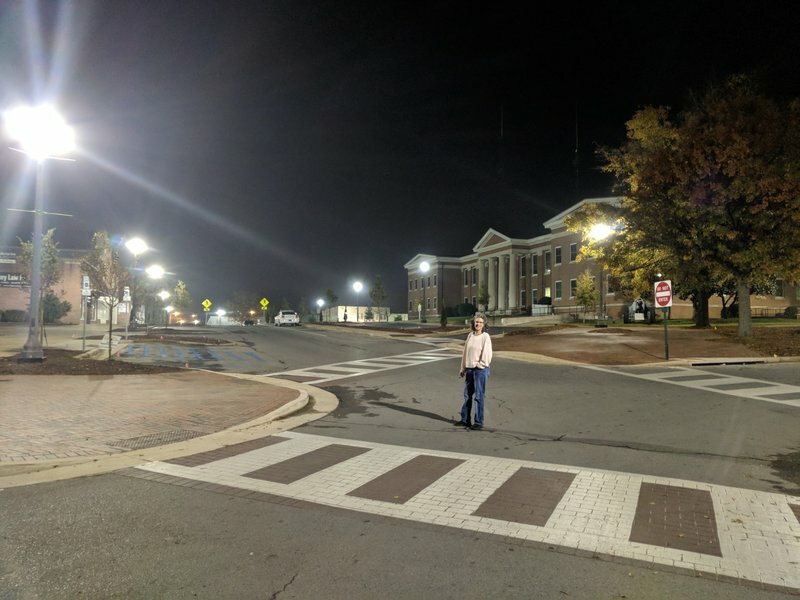 Laurie could have stood in this crosswalk for ten minutes. Camping out in anticipation of the big ski sale at Unclaimed Baggage! 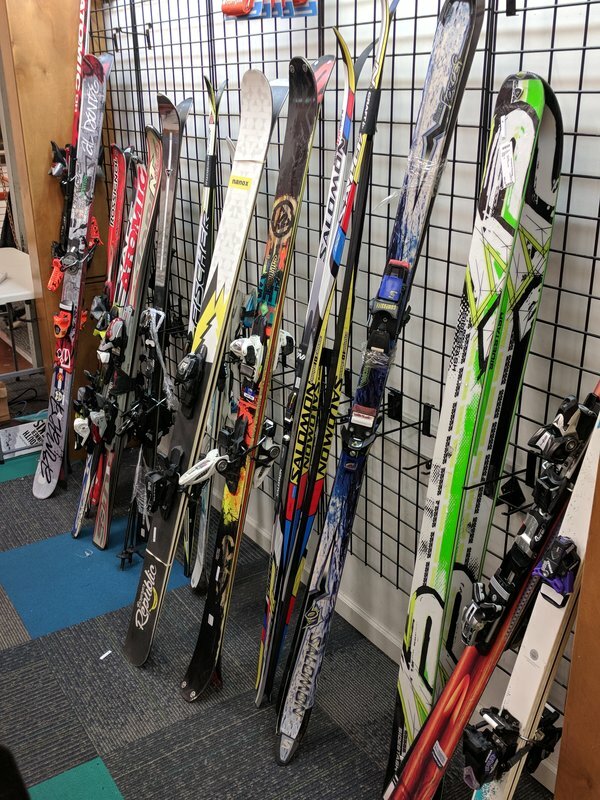 Saturday November 4th is their once a year massive ski sale, and people come from all over to participate. We planned to jump into the middle of it with everyone else on Saturday morning. 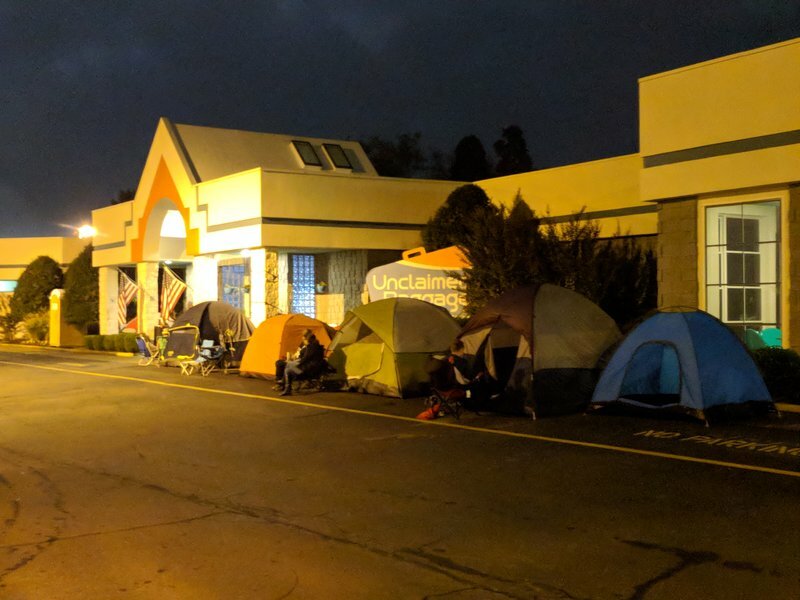 We drive by the store Friday night to find people camping out in anticipation of the Saturday morning opening. We talked to people who had driven 300 to 600 miles just to be there. This is gonna be huge. 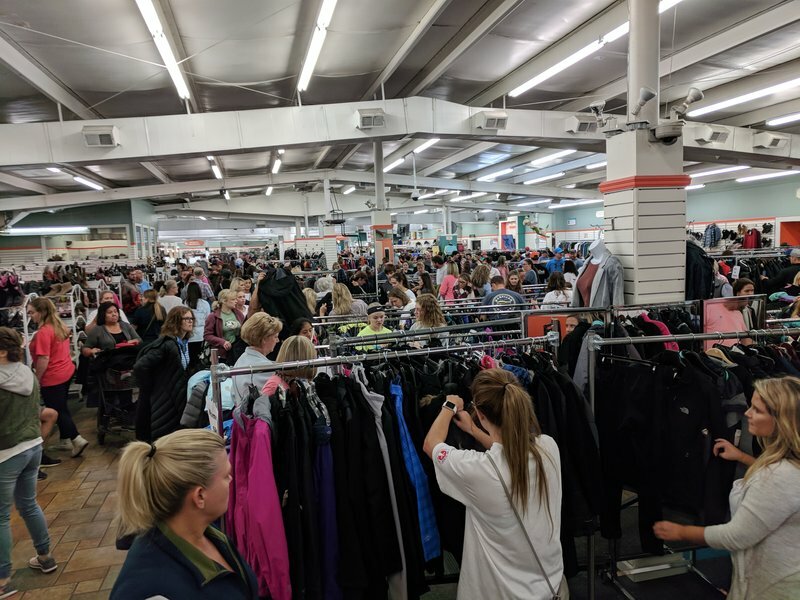 Ski sale aside, Unclaimed Baggage Center is a legend in its own right. It has been featured on news shows and in documentaries world wide. It consists of a 40,000 sf. warehouse style building full to the rafters. Someone said to me once "it's like Goodwill sort of". My reply was "Not really. Goodwill is stuff people want to get rid of. This is full of stuff that people DIDN'T want to get rid of." 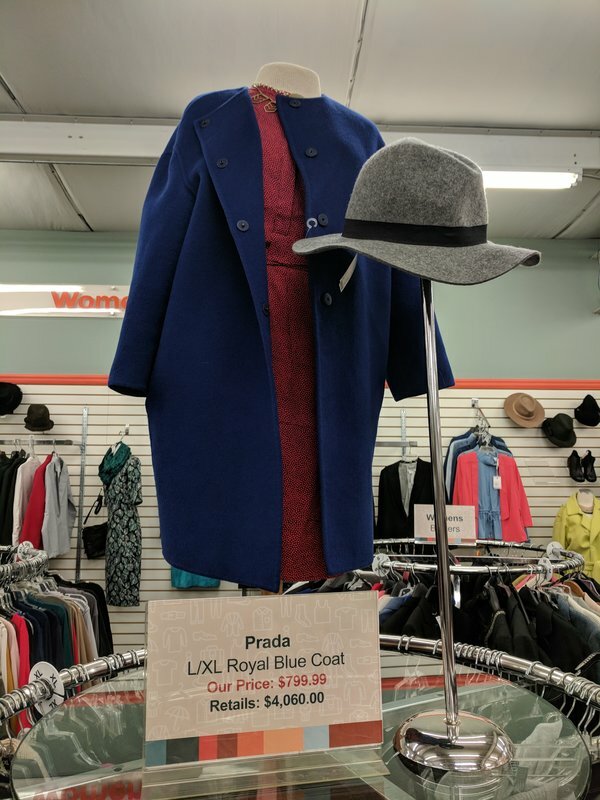 Prada.....a bargain at Unclaimed baggage. Retail $4000, yours for only $799! Airlines lose bags. It happens. You have millions and millions of checked bags each year and even a tiny fraction of a percent means big numbers. When the airline loses a bag, they put a lot of effort into getting it back to the owner. After all this effort to get it back fails, the airline settles with the owner for a certain monetary amount (I think the max in the U.S. is $1200 but don't quote me on that) and the contents once found become the property of the airline. All the airlines then send these bags to the Unclaimed Baggage Center. 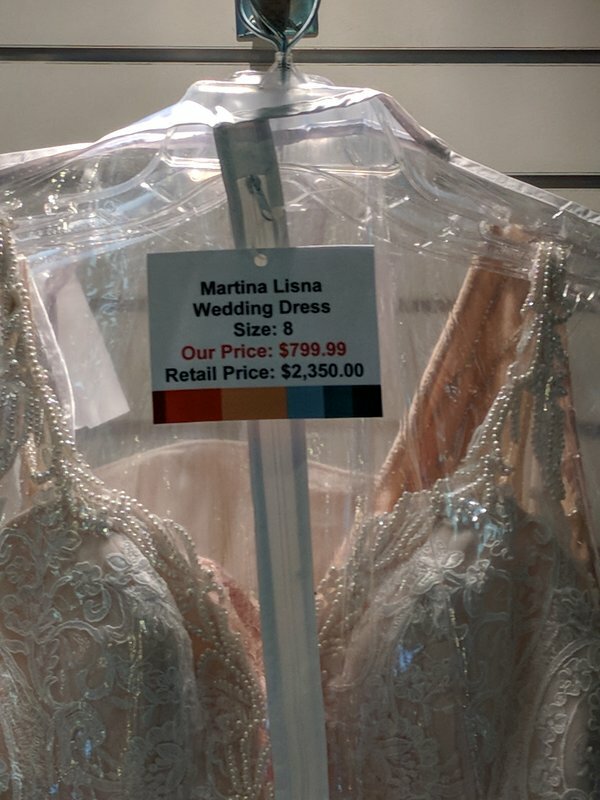 A designer wedding dress, a steal at $799.....but I am sure the person that lost it was quite sad. When the bags come in, they are gone through and sorted. All clothing is sent to their own in house laundry and dry cleaning plant where every single item is washed and cleaned. Electronics are wiped of personal information, data cards are taken out of cameras, jewelry is appraised, and everything receives scrutiny before it is put out for resale. The coffee shop/cafe. Fully equipped with multiple big screen TV's with all matter of sports. WIFI and coffee too! Something to keep the spouses busy while the other shops. Unclaimed Baggage Center also has its own charitable giving branch called "Reclaimed for Good". They take certain items out before they go to the sales floor and donate them. (Reclaimed for Good link) These things include broken wheelchairs that are rebuilt and given to children in developing countries, found prescription glasses that are given to the Lions Club, and medical supplies that are shipped to developing countries that can use them. There was even a display for donations for Christmas boxes to be sent overseas in the store during the ski sale. 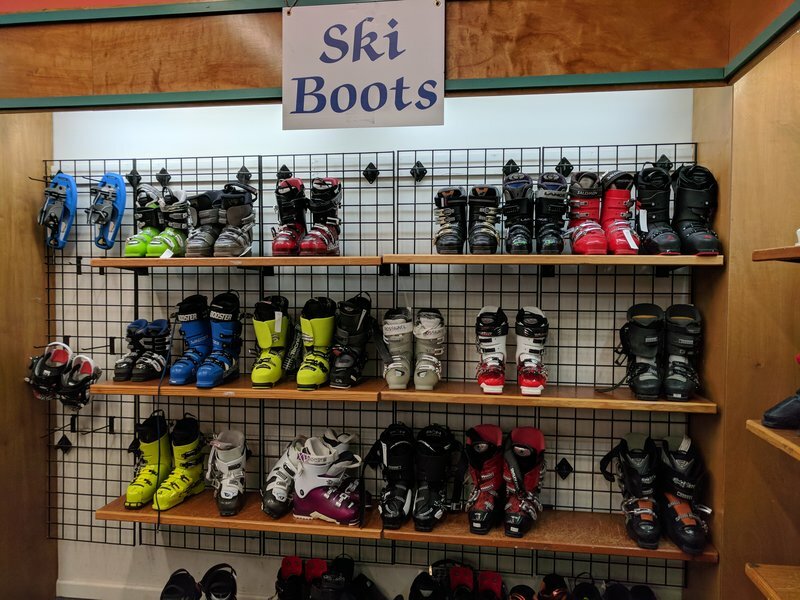 The items on display are mind boggling and include electronics, jewelry, designer clothes, fur coats, wedding gowns, sporting goods (in addition to ski stuff), musical instruments, you name it, they got it. The place is just incredible. This was our second trip, but our first to the huge ski sale. We skied for the first time in 25 years last year. We enjoyed it so much that we plan on doing it again.....so some "new" ski clothes would be helpful! There were more than a few people there. This is kill or be killed shopping......not for the squeamish! I don't know if you've priced new ski clothes and equipment lately, but buying new gear is quite costly. I looked at really nice ski parkas and thought that a kidney transplant may be less expensive. Nice ski parka style coats run anywhere from $ 300 on up for good quality name brands. You can have serious money in quality ski wear, and since we don't go often we would like to save a few bucks. I've also found that buying cheap is a false economy. I recently gave a Gerry down ski parka to a friend of our daughter. It's "retro" and cool and it doesn't fit me anymore......because I wore it when I worked on mountain 35 years ago. It was not cheap then. Quality holds up and is usually money well spent and that parka is proof. Hopefully we'll find similar quality stuff for our next ski trip......but at a bargain. The crowd goes on and on. New racks are rolled out hourly. They were still rolling stuff out at 6 p.m. that night. We get up Saturday morning. We're older and wiser now and don't have it in us to camp out, or be there when the doors open at 7 a.m. We get up a little after 7, have breakfast at a small town diner, and then head over to the ski sale a little after 8 a.m. When we arrive, the parking lot is almost full, and we are able to find a spot way in the back. 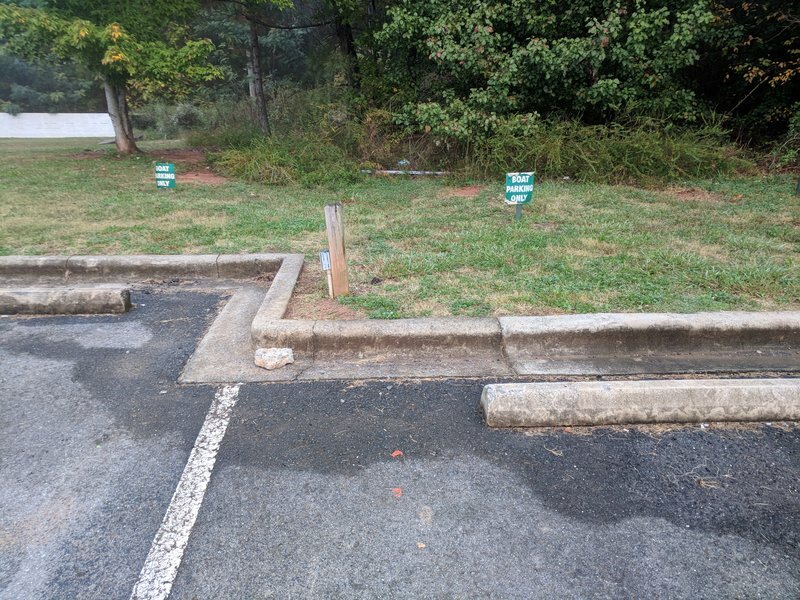 By the time we get out and start walking towards the store, the rest of the parking spots are full. We enter the store through the side door and wind up right in the middle of bedlam. 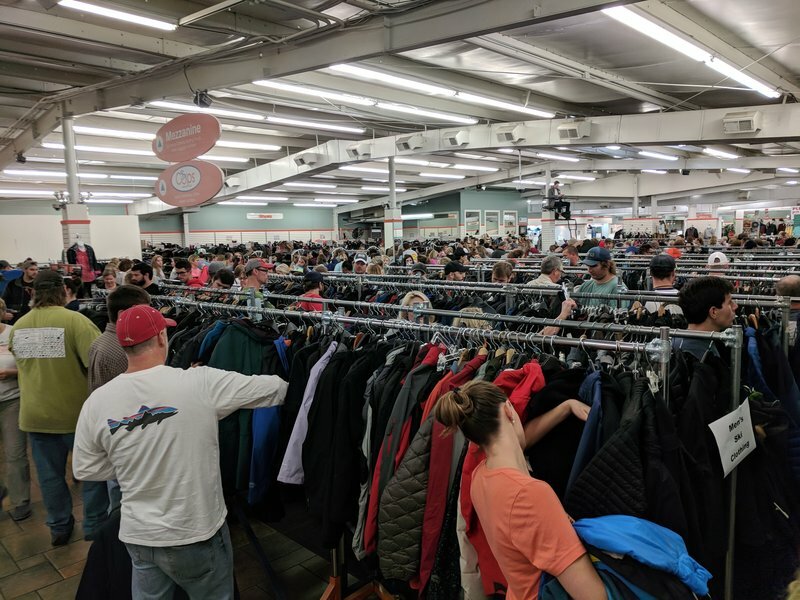 There are hundreds and hundreds of people in rows and rows of racks, going through thousands upon thousands of coats, sweaters, ski pants, and other cold weather items. We jump in with the rest of everyone and quickly learn the "rules" and how this game is played. There is a certain way this shopping is done, and it is somewhat from necessity. Some people are doing it out of greed...but we'll let that slide. 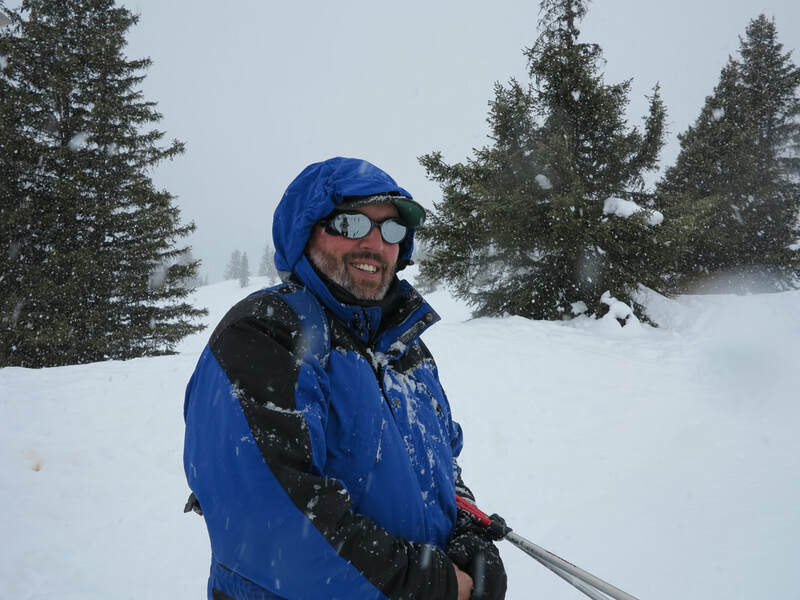 I talked with one guy that got skis and poles for his wife for $125. I also saw a brand new pair of K2's without bindings for $99. It is good to carry one of the huge canvas shopping bags that the store furnishes over your shoulder. It is also important to work in a team of at least two people, but three or more is preferred. It is incredibly crowded and the rows are close together. You go up and down the row with your shopping bag on your shoulder. Pick out things you like and want to see if they fit, and put them in the bag. When you reach the end of the row, you meet your accomplice and empty the bag into a shopping cart that the accomplice is in charge of. It is IMPOSSIBLE to try on clothes at the racks or in the rows. It's just too crowded and holds things up. After a few rows, you meet the shopping cart accomplice and start trying things on. If you like it, put it back in the cart. If you don't, or it doesn't fit, you can return it to the racks yourself or give it to the store employee near the dressing rooms who will put it back into circulation. There are dressing rooms, but most of the jacket/coat trying on occurs in corners of the main sales floor. The dressing rooms are used more for ski pants and things that might draw an admiring crowd if you tried them on out in the main part of the store. Be aware that shopping in this part of the store is INTENSE and kinda aggressive. If you don't like crowds, plan on coming to Unclaimed Baggage on another day. This is their biggest sales day of the year, consequently, there are lots of people and it is a frenzy. There are also a lot of bargains. Plenty of boots to choose from! Laurie got a great pair of Gerry ski pants that fit her perfectly for $36. 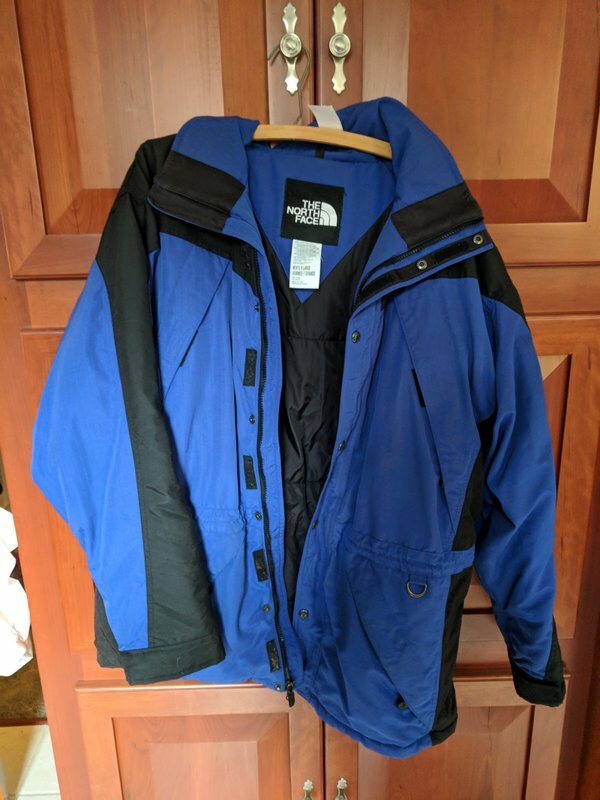 I found a North Face ski parka that while it showed a few minor areas of wear (more like well broken in) was still in really good shape. I paid $30 bucks for it. Brands include Mountain Hardware, Spyder, North Face, Gerry, Patagonia, Arc'Teryx, and any other brand you can think of. You just get in there and start rifling through the racks with everybody else......there are no VIP's here. It is survival of the fittest. After some clothes shopping, we headed to the other end of the store to check out the hardware. We stopped at the in store cafe for a break from the intensity. The cafe has big screen TV's with sports going, mainly to keep husbands occupied while wives shop. It is quiet and they also serve food. We needed a break after the intensity of clothes shopping! After this respite we head to our next shopping area. My North Face parka. A steal at $30! We had no intention of buying skis today but wanted to check it out. The sporting goods and electronics are in another wing of the store far away from the rugby scrum in the clothes shopping area. On our previous trip....this department was a troublesome area for me. Mainly because I bought things here. Today was no exception. I bought a great Samsung Tab A tablet here on our last trip. I love it, got a fantastic price on it, and have tried to integrate it into travel blogging. I've done a few "how to" blogs and a NYC trip with it to get used to the differences before our next international trip. I finally had to admit that while I'm able to do blog posts and such with the android tablet, it is a struggle. Sometimes a website doesn't like the android OS and won't let me fill out a form. Transferring photo files is a little more work. 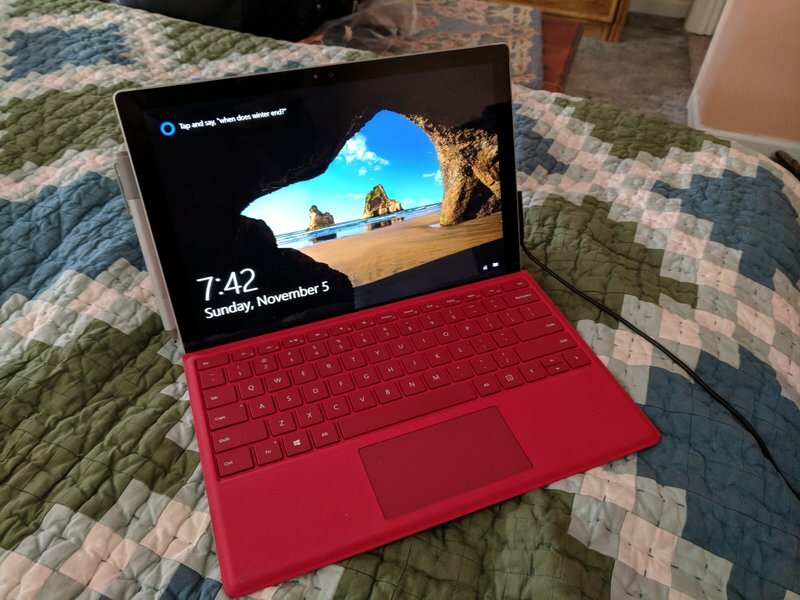 These reasons and others have me looking for a Windows based tablet to blog with. I use a Microsoft Surface at work. They are the Cadillac of tablets and incredibly useful. The university purchased these for the project managers and they were money well spent, making us much more productive and effective in our jobs. Remember how I joked about nice ski wear costing more than a kidney transplant........well, Surfaces are like getting two transplants. Their top end tablet, with a keyboard and pen are over $1600. Consequently I have been saving up and looking for a lower end Windows tablet as that is what I can afford. I had decided on the HP Spectre X2. While not as nice as the Surface, I could afford one. It had a slower processor, less RAM, and less memory. I didn't expect to find one at Unclaimed Baggage. And I didn't. What I did find was the top end Microsoft Surface.............yeah........the incredibly expensive one. I asked to see it. It was in fantastic shape, and looked brand new. Not a mark on it. It had the keyboard and pen ($139 and $99 respectively) on it as well. It had the huge memory, tons of RAM, every bell and whistle they make. It is the best tablet made now. Price? $449. My new Surface. I'm blogging in style now! While I didn't expect to make this purchase on this visit..........getting the top end tablet made for a fraction of its retail price was just too good a deal to pass up. I am the owner of a Microsoft Surface. This is my new blogging platform and will hopefully carry me through many future adventures. I also purchased a designer brand camera case (7 bucks), two GPS's (10 bucks each), and a few other nicknacks. The damage is done and we head out, leaving the Unclaimed Baggage Center behind....until our next visit. We head out with a stop for lunch at the W.H. 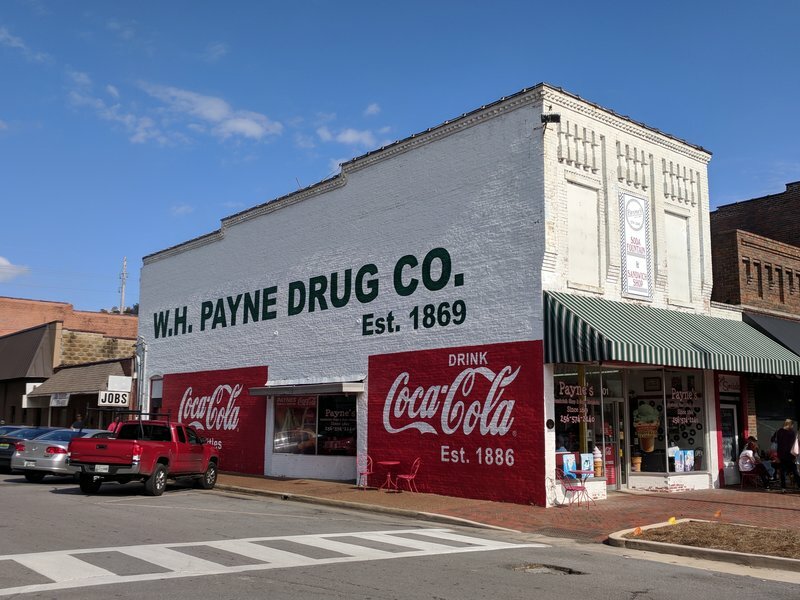 Payne drugstore on the courthouse square. They have long since quit selling pharmaceuticals and it is now an old style soda fountain. The business is the longest continually operating business in Alabama, open sine 1869. I had great hot dogs, a really awesome potato salad with bacon in it, and Laurie had sliders. Total lunch cost was $12, in a really cool historic establishment. Do stop in for lunch. 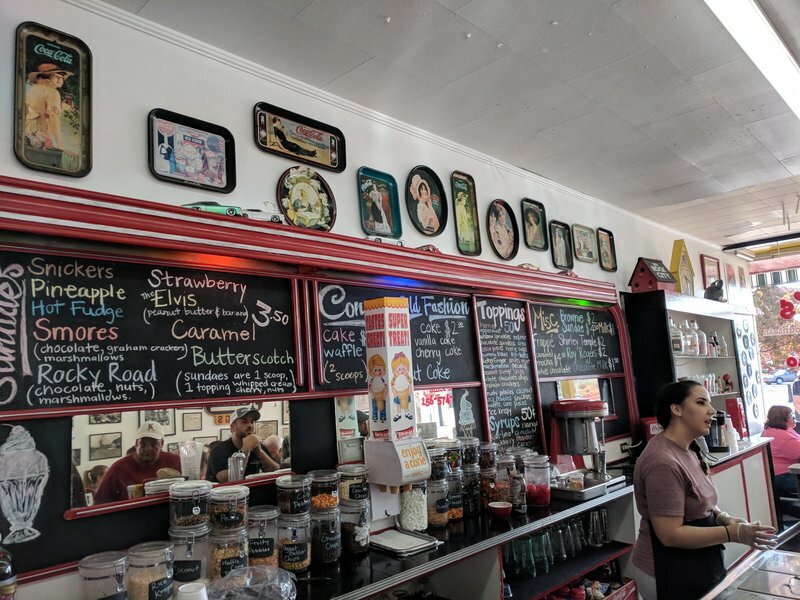 This soda fountain has been in business since 1869. After our lunch, we head towards home, a little less than 2 hours away. Like the last time we went to Unclaimed Baggage, we spent more than we expected.....but the deals we got made it worth the trip. Unclaimed Baggage is less than an hour west of Chattanooga. If you're local, you have to go at least once....and if you like bargains, you'll go again. If you're a traveler, it is a great stop and the area will give you a real idea of what life is like in a small southern town. The old soda fountain....which had quite the crowd on this particular Saturday. While I normally end out with "Let's travel! ", this one is a bit different. I already live in this area. So............Come visit! I'm Bill. My wife Laurie and I love to travel and share our stories. We especially love it when we have been able to motivate our readers to start traveling on their own, and making their own stories.